I wonder how it feels to be Lionel Messi right now, knowing that he’s finally come to the end. The pain, the heartache, the stress, the nerves, the anger, the frustration. The excitement, the hope, the joy, the pride. All the emotions that have coursed through Messi’s body every time he’s pulled Argentina’s white and sky blue shirt over his head—the negative ones surely outweighing the positive—all of them so close to being permanently consigned to the past. At a time like this, knowing the unfathomable and unique pressure he’s been under for basically his entire adult life to win the World Cup for Argentina, knowing that there’s nothing else in the world he’d rather do than accomplish that goal, and knowing that he will almost certainly fail once again, I wonder how it must feel. 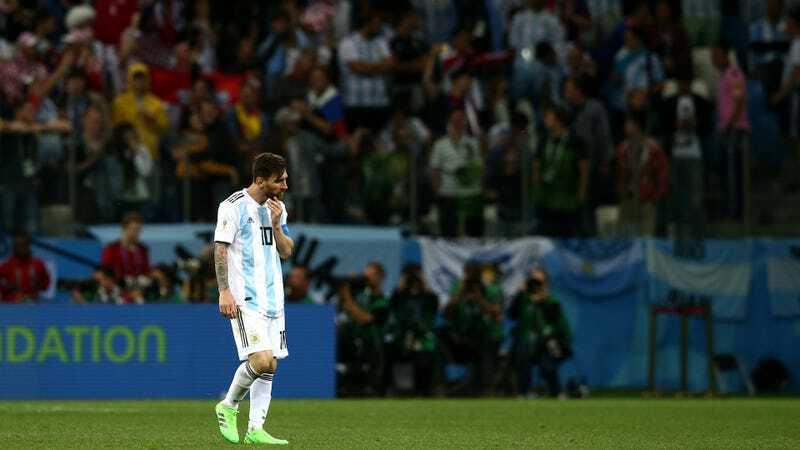 One thing seems clear: Whether Argentina find themselves ousted from the World Cup at the group stage or if they somehow back their way into the knockout rounds and get bounced there, Messi’s impending international retirement once this tournament is over feels guaranteed. He’s basically said as much already. When asked in an interview with Spanish newspaper Sport about whether he’ll call it a day with Argentina after the World Cup, Messi said “I don’t know. It depends how we do, how it ends.” He echoed that sentiment in an article he wrote right before the tournament started for the Argentine paper, La Nación, saying “They ask me if it will be my last World Cup and I do not know. I’m not thinking about it now. Surely it will depend on how this month goes, how we finish in the tournament.” In other interviews he’s called this World Cup his “last chance,” explaining how this will be the end of his generation’s time with the national team regardless of what happens out on the pitch. Though he’s expressed doubt about whether this World Cup will be his final run with Argentina or not, clearly the end of it all has been front and center in his thoughts. The unspoken part of these retirement comments is whether Messi would be more prone to retire if Argentina win or if they lose. History gives us some insight into which way he’s probably leaning. The fact that he announced his international retirement once before, after losing the Copa América final in 2016 (before reversing that choice later), implies that the current debacle would push him closer to the exit door than a seat on the plane to Qatar in 2022. And while those three consecutive tournament finals he and his compatriots made it to and lost in were heartbreaking, the current way Argentina look set to flame out of a major tournament will be exponentially worse. Despite what people who hadn’t looked too closely at the situation might’ve believed, success for this Argentina group was always a long shot. The team simply isn’t very good. The name “Argentina” still conjures images of copious reserves of exceptional players, and the five best Argentine strikers are to this day way better than the five best strikers of any other nationality. Plus, Messi is considered by many the G.O.A.T. and G.O.A.T.s are supposed to win. But anyone familiar with the ins and outs of this team—the total lack of elite talent in defense and in midfield, the deterioration of mainstays like Javier Mascherano and Ángel Di María, the emotional baggage weighing on this particular group—could’ve told you that anyone expecting Argentina to be legit contenders to win the tournament was deluding themselves. Argentina’s seemingly inevitable humiliation on the sport’s biggest stage isn’t solely or even mainly due to the weakness of their lineups—though the lineups are incredibly weak. Messi is the only member of Argentina’s starting XI from yesterday who would definitely make it into the starting lineup of the true favorites Brazil, Germany, Spain, and France. Eight of Argentina’s 11 starters yesterday wouldn’t even make the roster of a single one of the real contenders. The team is quite simply nowhere near good enough to challenge for the World Cup title. However, that by itself doesn’t explain or excuse why Argentina have looked so awful during the tournament. As Iceland demonstrated against Argentina, and as Portugal proved against Spain, and as countless other teams at this upset-heavy World Cup have shown, you don’t need all the best talent to look good in this tournament. And the reason why Argentina haven’t even been able to look competent against Iceland and especially Croatia is the real reason why this team never had a shot. It’s difficult to communicate just how devastated Argentina’s core players have to have been by the events of the past few years—Messi especially. By now everyone knows Messi’s fraught history with his homeland, how desperate he is for validation and acceptance from the country he loves yet which regards him with with skeptical eyes. So he and the cadre of teammates that have accompanied him on his quest to turn the hearts of their countrymen have done everything they could to win something big. They came agonizingly close in the last World Cup, only to falter in extra time of the final. They rebounded the next year, making it all the way to the final of the Copa América, only to once again fail, this time on penalties. They picked themselves up one more time and returned to the Copa América Centenario final the year after that, and once again were gutted when they lost in the penalty shootout. Three consecutive heartbreaks, each one ramping up the pain and the pressure for the next tournament, each loss only turning the Argentine fan base more and more against the team, each year eating away at the skills of the players and making it even harder to do what is demanded of them. It’s almost impossible to come up with any other team, in any other sport, that’s experienced this kind of longstanding and dread-inducing pressure. For better or for worse, Argentina’s World Cup still isn’t over yet. Nigeria beat Iceland today in Group D’s other match, which in theory puts Argentina in pretty good position to advance from the group in spite of their woeful play. If Argentina manage to beat Nigeria in the final match of the group round, they’ll have great odds of qualifying for the Round of 16. The context, though, speaks against any salvation. Argentina haven’t looked like a good team in ages. The last good team they’ve beaten in a meaningful match was a World Cup qualifier against Chile in March of 2017. Back in November, Nigeria thumped Argentina in a friendly by a score of 4-2. What might appear to be a bit of respite in the third chance Argentina have been handed to still advance out of the group looks more likely to be felt as another terrifying opportunity for them to fail spectacularly. And even if Argentina do beat Nigeria and make it to the Round of 16, there is no reason to believe their time in the knockout rounds will come to anything other than a swift and ignominious end. How must this all make Messi feel? Sad? Dejected? Disconsolate? Fearful? Enraged? Relieved? All those emotions have to be in there somewhere. Winning the World Cup would’ve been the crowning achievement of Messi’s already impossibly decorated career. It almost definitely would’ve consecrated him as the hands-down best player to ever play the game. More importantly, it would’ve given him the adulation and respect of his fellow Argentines, which remains the one thing he’s coveted above all else. To miss out on all of that for reasons both outside and within his control—it’s not entirely his fault, but it must be said that Messi has not played as well as he could and should have so far in this World Cup—has to be depressing. To have felt the unrelenting pressure to do the impossible by winning this World Cup knowing full well that it was nearly impossible had to have been almost debilitating. To go out there knowing you’d fail, knowing the failure would be attributed to you more than anyone else, and stepping onto the pitch and trying to win anyway requires no small amount of bravery. And yet more than anything, I wonder about that relief he must feel. Messi has been humiliated in the biggest tournament in all of sports after years of having his heart shattered on that same stage over and over again. Few will fault him once Argentina’s tournament is over and he does what he’s all but promised to do by retiring from the national team. Though he’ll never accomplish what would’ve been the biggest and most important feat of his life, at least he’ll know that he never has to subject himself to that withering pressure and stress and criticism of both the founded and ridiculous variety ever again. All that will be left is to finish out the back end of his playing career at club level. After that, he can sit with the memories of what is inarguably one of the greatest athletic histories the world has ever seen, still feeling the pain from his Argentina tenure but at least never again experiencing it in the present. It’s the bleakest sort of relief, but it’s relief nonetheless. It’s far less than he deserves, but it might be just what he needs.